Weddings are special occassions and finding the perfect wedding guest outfit can sometimes be a struggle, At Girl Meets Dress we can help you find dresses to wear to a wedding. Here’s our GMD guide for what to wear to a wedding. We have a large collection of dresses for weddings to hire. 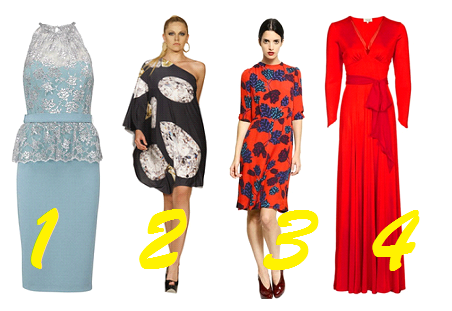 Here are our top picks of wedding guest outfits avalible to hire now straight form GMD HQ. This pretty pastel blue shade is perfect for any summer event, with its lace overlay and elegant high neck line it would be the perfect dress to rent for a wedding. This Loren Print dress is chic and simple, with it’s fun twist of a large print simply add a large clutch to create the perfect outfit. This Marc Jacobs print is bright and fun, the cut of this dress creates a subtle feminine look perfect for any event. This Beulah gown is a fun twist on a classic dress style, the bright red hue and floor length skirt creates an elegant and sophisticated feel to the dress and would make it the perfect dress to hire for a wedding. Posted June 9th, 2014 in Uncategorized. Tagged: Andrea Dress, ARIELLA, beulah, dresses for weddings, Dresses to wear to a Wedding, Gorgeous Couture, Loren Print Dress, Marc by Marc Jacobs, Mareika Tulip Print Dress, Red Isadora Gown, wedding guest outfits, What to wear to a wedding.